Microbes in the gastrointestinal tract of ruminants such as moose help break down recalcitrant plant biomass into carbon nutrients, but how do they do this over the course of seasons when the moose diet changes, and what microbes are involved? 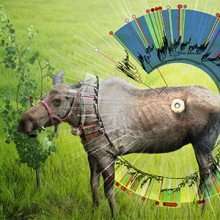 Now, an international research team has studied microbial communities in the rumen of live moose and gained a more holistic view of a complex microbial food web that is responsible for carbon processing in that ecosystem. Microbes breaking down biomass play a vital role in a surprising number of processes, including which chemicals are released into the air and whether a useful biofuel or bioproduct can be formed. By understanding how microbes process woody material like twigs and bark in the guts of moose, scientists can better predict how changes in the seasonal diet of these animals affects their ability to break down these woody materials. They can then extend this understanding to help biofuel, bioproduct, and chemical processing in industry. While previous studies used hunter-killed animals, this study sampled live free-ranging Alaska moose grazing in the wild. By equipping these moose with rumen fistula, a port to their gut, the team could sample the animals as they digested a natural diet. The effort provided first-of-its-kind access to the microbial communities residing in the rumen of these animals as communities actively degraded woody plant biomass during spring, summer, and winter foraging months. A team of researchers from The Ohio State University, University of Alaska Anchorage, Norwegian University of Life Sciences, Denmark's University of Copenhagen, the UK's Newcastle University, Pacific Northwest National Laboratory, and the Alaska Department of Fish and Game took a deep look into microbial functioning in rumen. The work made use of protein and metabolite data gathered using 600-MHz nuclear magnetic resonance spectroscopy at EMSL, the Environmental Molecular Sciences Laboratory, and genomic data obtained from JGI, the Joint Genome Institute through a Facilities Integrating Collaborations for User Science (FICUS) initiative, which allowed the team access to the expertise of the two Department of Energy Office of Science user facilities, both sponsored by the Office of Biological and Environmental Research. Studying such rich data in combination with state-of-the-art enzymology gave researchers a glimpse into how microbes are specialized and how they coordinate their tasks to mediate the overall "flow" of carbon within the rumen. The analysis enabled metabolic insights into 180 genomes, most of which were previously unknown, and addressed the underappreciated influence that viruses exert in ruminant digestion. Their efforts deciphered community structure and metabolic handoffs underpinning this animal hosted-microbial ecosystem, with findings relevant to agriculture, human health, and biofuel production.